Three Friends and a Taxi is a tale first told to the author by a local guide in a taxi in the islands of the Comores. Sheep, Goat and Dog take a taxi to the sea and must face the consequences of their own actions when the time comes to pay the taxi fare. It is a tale told all across Africa, from Nigeria to the Comores to South Africa, and belongs to all of Africa and its people. 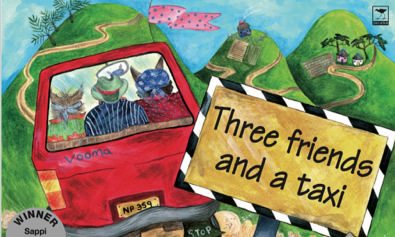 Three Friends and a Taxi was a winner of the 2004 Sappi Isiqalo Book Competition, which encourages South African authors and illustrators to develop material with a local idiom to promote reading, writing and access to books for all.